Sonoma Family Meal: Healthy, Digniﬁed Comfort Food for Fire Victims. Erin Havstad’s life lately has been awash in compiling personal property lists, managing a complex home rebuilding process, commuting to work from a temporary home in Cloverdale, and a host of other stresses. One thing she doesn’t have to worry about, since losing her home in Coffey Park, is her family’s access to nutritious meals. The Havstads were one of 25 families chosen as clients for a pilot program launched by Sonoma Family Meal in late 2017. Every Monday, Havstad drops in to Franchetti’s restaurant in Santa Rosa to pick up an insulated bag filled with a free chef-cooked meal that feeds 4 to 6, plus a loaf of Franco American bread and salad. 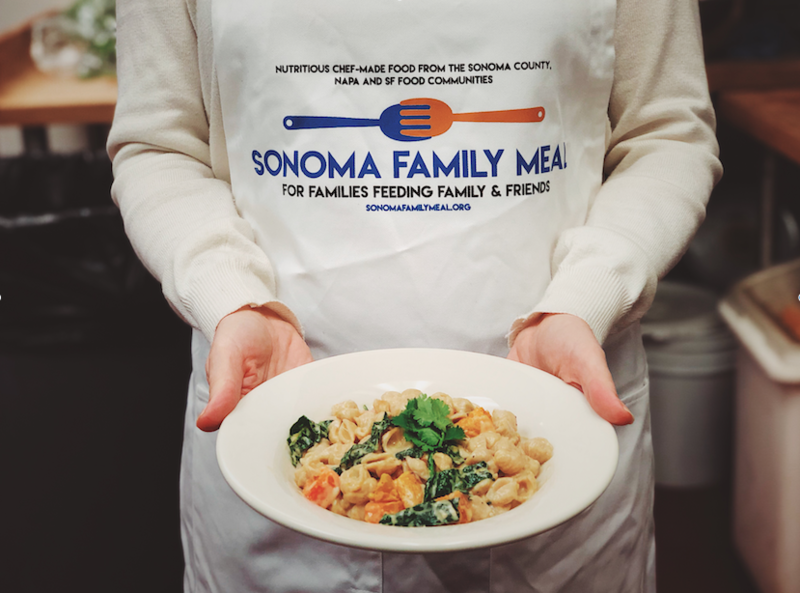 Sonoma Family Meal was launched as an emergency response in October by Heather Irwin, a local food writer. Irwin used her connections forged over the years to coordinate chefs, kitchens, and thousands of pounds of donations. The ultimate goal is to provide nutritious, delicious, locally sourced comfort food to traumatized fire victims. “Food is comfort,” says Irwin. “Food is emotional support.” In December, Sonoma Family Meal was officially incorporated as a nonprofit and Irwin became the organization’s executive director. A donation of $30,000 from Redwood Credit Union’s fire relief fund allowed operations to resume in January with the hiring of chef Heather Ames. Jon Franchetti donated his kitchen and restaurant in Santa Rosa as a cooking zone and pick-up spot. So far, meals have included vegan tikka masala, beef tacos, and mac and cheese, made with ingredients sourced locally from Umwalle Farms, Petaluma Poultry, F.E.E.D Sonoma, and Grounded Grassfed. Irwin says they plan to add an additional five families per week to the pilot program through a vetted intake process. Check the Sonoma Family Meal website for volunteer and donation opportunities or to apply to be a participating family: sonomafamilymeal.org.